I am a little crazy about waffles. There's just something about the little squares and maple syrup that attracts me to it. And of course the ice-cream. So when we drove by this place called Waffletown, I asked The Husband if we could turned back to have lunch at this place. Waffletown is a small cafe at Balmoral Plaza along Bukit Timah road. I think it must have been around for a long time now, since a friend of mine said she has been there since she was a student. It's a very simple cafe - more like a school canteen with aircon really. The place sells fast food, local style. Items on the menu included the usual western food choices like burgers, fish and chips, fried chicken.. and more local choices like chicken chop with rice and chilli fish with rice. The Sambal Chilli Fish with rice and coleslaw seemed like an odd combination but it was surprisingly good. The dory fish fillet was nice and tender and the sambal chilli was fiery enough to sting just a little. The rice had a bit of butter that made it slightly more fragrant and the coleslaw helped neutralized the spiciness from the chilli. The highlight for me was the waffles. I opted for the plain waffle with ice-cream. 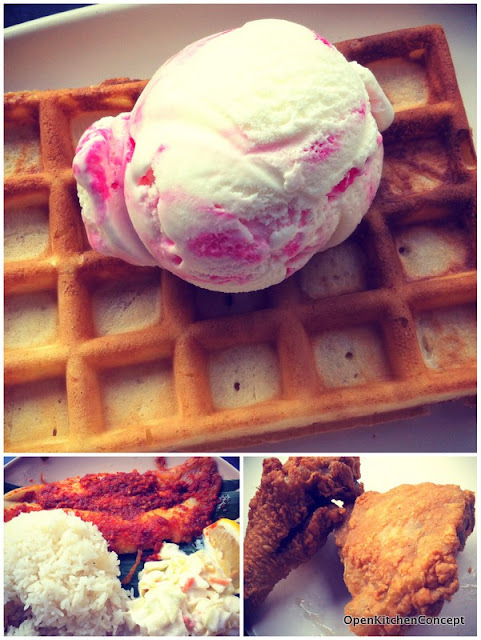 The ice-cream is your basic, run of the mill Magnolia ice-cream but the waffles were crispy and yet slightly fluffy. It's probably the closest to A&W waffles I've tasted so far in Singapore. I would probably visit this place a lot more if it were nearer my home. Sadly, it is a bit out of the way for me and there isn't much nearby for me to travel all the way for chilli fish and waffles..